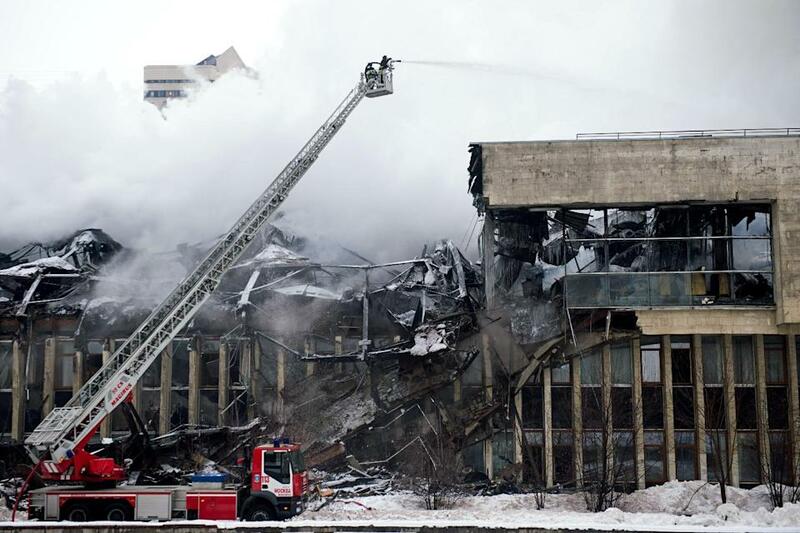 The blaze, which started Friday and was still not completely out on Saturday evening, ravaged 2,000 square metres (21,500 square feet) of the Institute of Scientific Information on Social Sciences (INION) in Moscow, which was created in 1918 and holds 10 million documents with some dating back to the 16th century. “It’s a major loss for science. This is the largest collection of its kind in the world, probably equivalent to the (United States) Library of Congress,” Vladimir Fortov, president of the Russian Academy of Sciences was quoted as saying by Russia press agencies. “One can find documents there that are impossible to find elsewhere, all the social sciences use this library. What has happened here is reminiscent of Chernobyl,” he said referring to the 1986 nuclear catastrophe. Fortov said about 15 percent of the collection had been damaged at the library, which includes one of the world’s richest collections of Slavic language works, but also documents from Britain, Italy and the US. Fortov told Kommersant FM radio that much of the damage was caused by water from the firefighting operations. No one was injured in the inferno. The fire broke out on Friday evening on the library’s second floor and continued burning all day Saturday despite 200 firefighters’ efforts to douse the blaze. Library authorities initially said the documents were not in danger, but once the fire caused 1,000 square metres of the roof to collapse they were less certain about the risk to the collection. A rescue service source told state-run RIA Novosti news agency it was impossible to remove the books because of the intense heat in the building. According to Russian media, investigators looking into the cause of the blaze suspect an electrical short-circuit was to blame. MOSCOW, October 28 (RIA Novosti) – The authorities of Russia’s Arkhangelsk Region are set to apply to Russia’s Culture Ministry to include the unique objects of Russia’s Arctic culture heritage into the state culture heritage registry for further state protection, the regional Culture Ministry reported. The initiative has been discussed at a meeting of the commission on the maritime heritage of Russia’s Marine Board within the framework of “For the Glory of the Fleet and the Fatherland” forum. A resolution passed on Tuesday by the Sverdlovsk regional government, enters the place outside Yekaterinburg, where the remains of the family of Russia’s last tsar Nicholas II were found, on the national cultural heritage list, the regional government’s press service reported. “The resolution enters the place on Staraya Koptyakovskaya Road, where the royal remains were found, on the national register of cultural heritage sites, where it will be defined and saved for future generations,” the press service said in a statement. Spokesperson for the regional property ministry Galina Utkina told Interfax that a letter requesting that this site be entered on the national register of state protected cultural monuments, will be sent to the Culture Ministry. After the site is entered on the register, all actions at the place where the royal remains were found will be banned unless approved by the regional property ministry, she said. “But further research will be allowed, if a plan is negotiated with us, so we will know who is doing what at the site,” Utkina said. The remains of Emperor Nicholas II, Empress Alexandra Fyodorovna, the grand duchesses Tatiana, Olga and Anastasia, and their servants were found on Staraya Koptyakovskaya Road near Yekaterinburg in the late 1970s. In July 1998, the remains were buried in the Peter and Paul Cathedral in St. Petersburg. The remains of Grand Duchess Maria and Crown Prince Alexei were found at the same site in 2007. “A fisherman dragging a net through a river in Siberia thought he had snagged a rock. Instead he had snared what experts believe is a 4,000-year-old pagan god figurine. Nikolay Tarasov, 53, considered throwing the 12-inch statuette back, until he wiped away the muck and saw that a ferocious-looking face had been carved into the artifact. On the back of the figurine, snagged in the community of Tisul, was what looked like hair, carved behind the head. Tarasov was told that the relic could be worth its weight in gold, but decided to donate his rare catch to a local museum, free of charge. “Experts there quite literally jumped for joy, and quite high!” he said.